Expedition Theme is oriented on points, routes and tours illustrated on the map. This theme is popular among guides regardless if it is the climbing guide, hiking tours or city sightseeing tours. What matters the most is the possibility to prepare any route by entering the start and destination address or GPS coordinates. 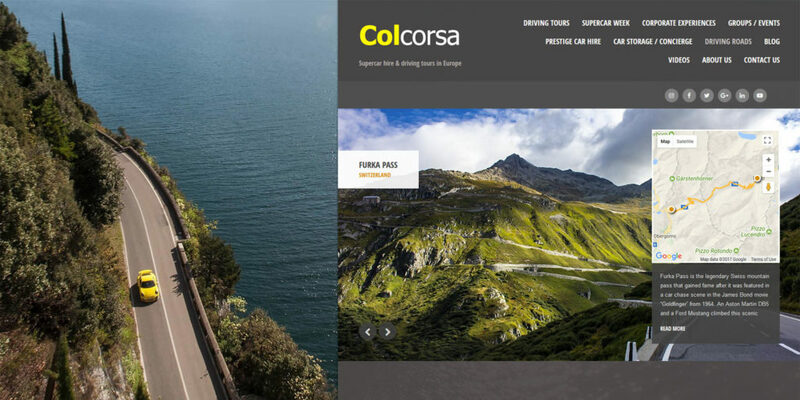 Tour Slider is a special element developed only for this travel theme that works as a Header on the web page. You can turn it on or off individually. It’s purpose is to attract the user’s attention. It’s a great demonstration of a particular tour right on the map. Whether it is the most favourite trip or the one closest to you. Admin can set up the Tour Slider according to his needs – there is a space for insertion of the presentation image, the start date of the tour, the short description and of course the map with the marked out route is displayed too. This is absolutely the best way how to attract tourists right on the homepage, especially if you create a travel blog! In addition to the Tour Slider, it is possible to use integrated Easy Slider or Revolution Slider for presentation of tours or travel expeditions. The Revolution Slider can be added directly to the Post. You can create slideshow with images containing the selected routes on the detailed Tour page. 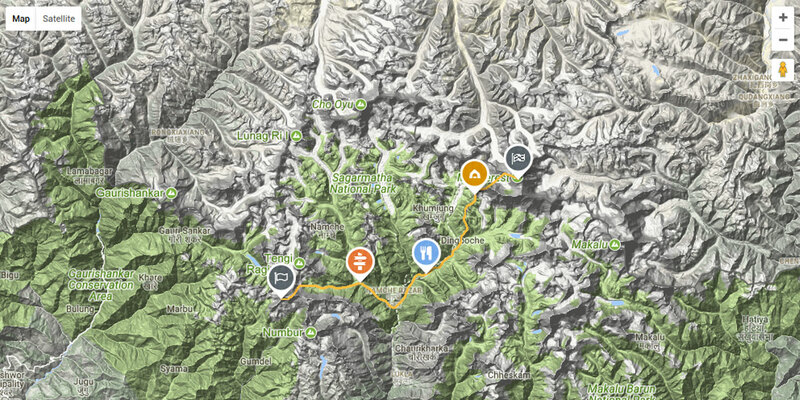 A specific feature, tailor made for our WordPress travel theme Expedition, is the possibility to add pins to the map. Pins show the interesting stops that are on the planned route. Custom icons are available to be set for pins individually therefore you can choose the icon that best reflects the type of place. 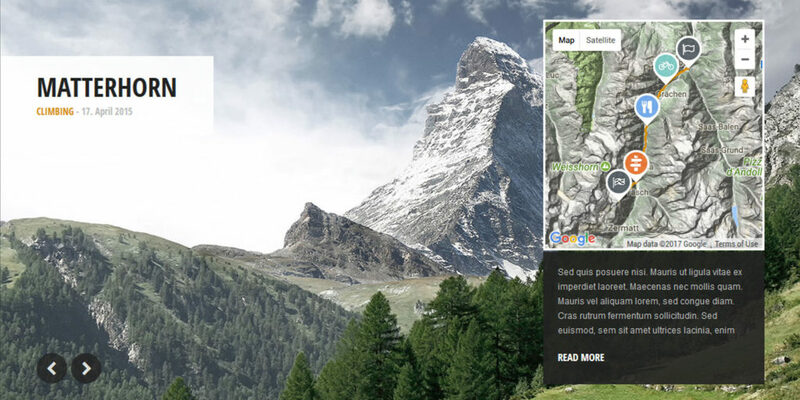 You can also add a name and a description of the place for each checkpoint. Manipulation with pins is also very practical. They can be moved around the map via drag & drop functionality. The best advantage of this feature is that it can provide tourists with an immediate display of entire route with the various types of places where they will certainly make a stop during their trip. Whether it is a camping break, refreshment or a visit of a specific city, historical monument or museum. Since it is easy to highlight all the planned stops in the sightseeing tours via pins, Expedition is often used as a travel theme for tourist guides. Thanks to the checkpoints tourists can better decide which trip to choose. Further tailor-made features arose from the need to offer visitors the most detailed information on each of the available tours. 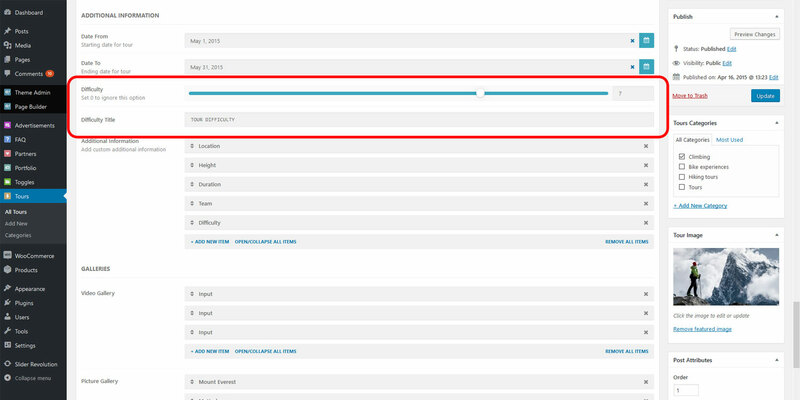 That’s why Tours work as a Custom Post Type where you can add new and edit the existing Tours. It is a unique feature that can be found only in this theme. 1st part contains basic Tour Options. Apart from defining the header layout (either Image only or Image+small map or Fullsize map), you can enter here the locality and individual checkpoints on the route. 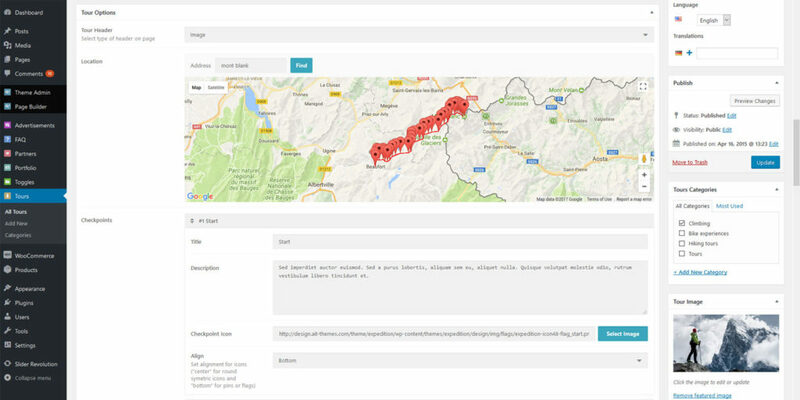 2nd part consists of Additional information, where in addition to the tour dates (date range from – to), you can find several unique input fields for adding detailed tour description. One of the custom inputs is the setting of the Tour difficulty. This tells the tourists at first glance if they can handle the tour (mountain hiking) or not. Other inputs are altitude, tour duration, recommended gear etc. 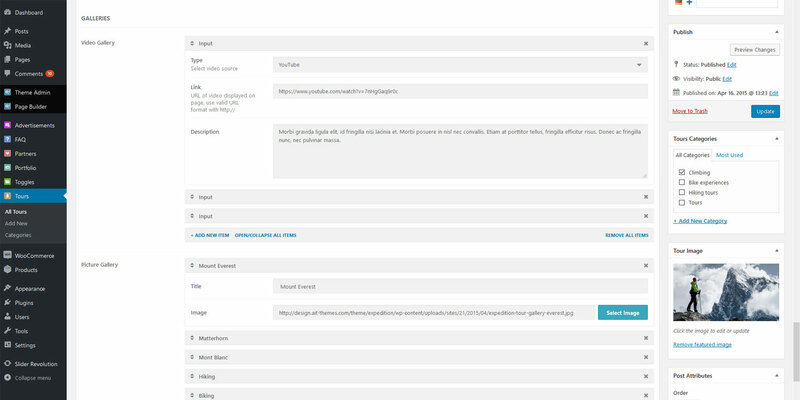 All of these inputs are configurable so that admin can customize them based on the needs. Last part of Custom Post Type Tours are Galleries. These can also be customized according to your needs – you can add any number of images and videos. Or you don’t need to add any. It depends on the particular Tour you want to present. WordPress travel theme Expedition is unique for its versatility. It’s suitable for tourist and mountain guides, travelers and travel agencies organizing city tours, sightseeing tours, museum, gallery tours, driving or cycling tours, ocean cruises and agencies offering entertainment tourism like skiing, ski mountaineering, diving or trips to nature reserves. Expedition is a multi purpose theme that offers more than you can imagine! 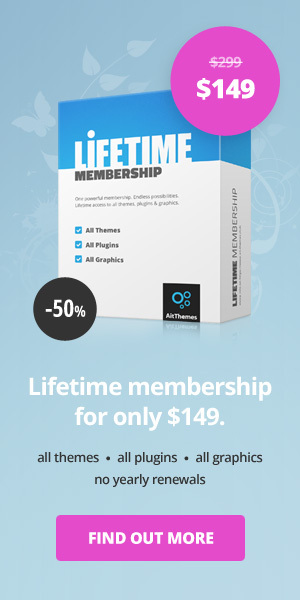 Buy Expedition Theme along with other 70 amazing themes included in the Full Membership. Now for the special reduced price! 1. Is it possible to turn off the map and leave only the image for Tours? 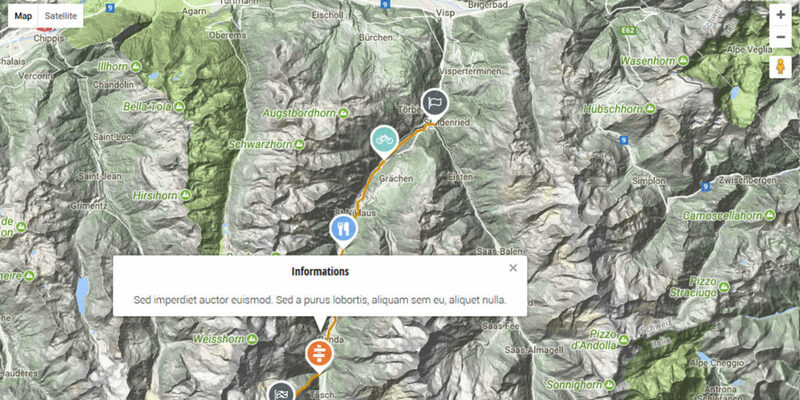 Yes, the map can be simply turned off / turned on via Tour Element in Page Builder. 2. Can the background image be centered within Custom Post Type Tours? Yes, just set the image display to full width (1920px of background screen). 3. What slider is implemented in the Expedition Theme for travelling? There is the classic Easy Slider available, as well as custom made Tour Slider, which is designed specifically for this template. In addition, also 3rd party Revolution Slider is available in the Expedition Theme. 4. I would like to create a slideshow for Tours. How should I proceed? For slideshow, you can use e.g. the Revolution Slider where you can upload individual images. Then you just need to set the time how long these images should be displayed and also the slideshow effects to be used and that’s it. 5. Does Expedition theme support Tours import in one of the popular formats (e.g. KML files)? Importing of Tours isn’t currently supported. Therefore Tours need to be created manually. 6. Can I enter multiple dates for city & sightseeing tours? If your tours take place on different days, we recommend to provide a date interval that is an alternative to multiple dates. Does Expedition have the option to turn on geo-location for the maps? Is this planned for future updates? we are sorry, there is no such a feature available by default. Currently we have no plan to create this functionality, anyhow we’ll consider it and make decision. Thanks Zlatko. Please include a geo-location option in the next update!!! It would make this the ultimate theme in terms of following a tour route map on a mobile device! thanks for your idea. We’l definitely consider your idea and make decision. 1) Is it possible to implement the geolocation feature using google maps API on your main map function? 2) Is it possible to manage each checkpoint on your map as an item (like your other theme CityGuide : https://preview.ait-themes.club/theme/cityguide/item/pharmacy/) ?